It was good to see our members, associate members and other professionals at the Texas Telephone Association’s Convention and Project Showcase over Sept. 9-12. No question, we are seeing many changes in the telecommunications industry. At the same time, we are seeing changes the Public Utility Commission of Texas. The legal and regulatory team for the Texas Telephone Association has learned the Public Utility Commission of Texas is restructuring its staff that oversees telecommunications along the lines of a wholesale/retail markets group and a licensing group. The wholesale/retail markets group will handle complex policy matters such as Earnings Monitoring Report filings under Senate Bill 586 as well as contested cases. The licensing group will handle more formulaic filings -- like Eligible Telecommunications Carrier (ETC) and an Eligible Telecommunications Provider (ETP) certifications -- standard Earnings Monitoring Report filings and other standardized reports. The new staff members leading each of the new divisions immediately reached out to TTA to set up meetings. This type of relationship with regulators is key to managing policies that impact our industry, and we are appreciative that long-time PUC staff members are encouraging new hires to continue to develop relationships with us. The wholesale/retail markets group will be overseen by a new telecom staff member, Diana Zake , formerly with Lone Star Transmission, an electric transmission company who worked at the PUC in the late 1990s. The licensing group will be headed by Cliff Crouch , who has worked at the PUC nearly 10 years and is former area manager for Southwestern Bell. TTA is arranging meetings to bring them up to speed on industry issues and continue to build strong working relationships with those individuals who will oversee the Texas telecommunications industry for years to come. The rulemaking before the Texas PUC to implement reforms to the Texas universal service fund under Senate Bill 586 is still pending. The rulemaking in Project No. 47669 will not be taken up at the September 27 open meeting of the PUC and could move to the first open meeting in October. We understand this schedule change is for administrative reasons. The open meeting will be the industry’s first opportunity to hear formally from the new PUC commissioners related to this rulemaking and the proposed rule, instructions and forms that TTA helped draft. TTA will continue to manage this important project and will keep members aware of significant developments. Since the rule is expected to be finalized this fall, TTA is taking the lead on putting together a proposed filing package to address the proposed rule’s requirement to file “all detail and supporting documentation necessary to support” the information included in the SB 586 Earnings Monitoring Report filings. Such supporting documentation will likely need to address the newer schedules to the draft report such as affiliate transactions and executive compensation, as well as revenue, expense and investment information included in the historic EMR schedules. TTA believes the PUC would greatly appreciate some degree of consistency in SB 586 EMR filing packages across the industry. To that end, TTA is working with member companies and their attorneys and cost consultants toward a uniform filing package for SB 586 EMRs. Activity continues in Virgin Mobile’s application with the Texas PUC to expand its Lifeline-only designation into additional rural areas across Texas in Docket No. 48502 . Virgin Mobile has been designated as both an Eligible Telecommunications Carrier (ETC) and an Eligible Telecommunications Provider (ETP) in certain non-rural service areas of Texas – including AT&T Texas, Verizon Southwest and Frontier – for the limited purpose of offering Lifeline services. Virgin Mobile’s application seeks to expand the area covered by those designations to include territory served by additional local phone companies across Texas. TTA and the Texas Statewide Telephone Cooperative, Inc. filed joint objections to most of Virgin Mobile’s request for information to participating members primarily on grounds that the information that Virgin Mobile seeks to require the industry to produce is both publicly available and irrelevant in answering the ultimate question of whether or not Virgin Mobile meets the Commission’s requirements for ETC and ETP designation. Virgin Mobile’s lawyers have been pushing for settlement discussions with the intervenors. TTA anticipates that after the ruling on TTA and TSTCI’s motion to compel, Virgin Mobile is beginning to realize that ETP designation in TTA member service areas is questionable at best under the current commission rules. Virgin Mobile could withdraw its request for ETP designation in local telephone companies’ service areas and focus its efforts on ETC designation so that it would become eligible to receive federal low-income support. Such a change may alleviate some members’ concerns with the application. In addition, because of the Federal Communications Commission’s previous decision that allows a lifeline-only recipient to become an ETC without having to serve a rural telephone company’s entire service area, there would be more limited legal arguments available to defeat any Virgin Mobile request. TTA will continue to oppose Virgin Mobile’s application while entertaining any settlement offers to reach the best possible outcome. We will keep members updated of any significant developments. The Federal Communications Commission on September 12 released a public notice indicating the federal universal service fund contribution factor would increase to 20.1 percent at the beginning of October. TTA encourages member companies to prepare for the anticipated rate increase, including applicable customer notice requirements. TTA notes that while this is the first time that the federal universal service fund assessment rate has risen above 20percent, it is not unexpected as the FCC continues to seem to be unwilling to tackle contribution reform. With a declining interstate revenue base upon which to assess contribution requirements, federal universal service fund assessment rates will likely continue to increase absent significant reforms. No question, elections can be exciting, exhilarating, and entertaining. Most importantly, elections have an enormous impact on our families, our communities and our businesses. In case you have been away, we in the final stretch of the mid-term elections when Texans will cast ballots for statewide offices – including governor and lieutenant governor – as well as for members of the Texas Senate and Texas House of Representatives and members of Congress. While most of the attention is on races in the U.S. Senate and Congress in the November 6 election, there are important state legislative races to consider. This year, 15 Texas state Senate seats are up for election, as well as two others in special elections. Texas senators run on staggered four-year terms, so roughly half of the 31 senators are up for election every two years. What we do know is that there will be at least four new senators in the next session of the Legislature that convenes in January. One race for the seat held by Sen. Van Taylor, R-Plano, who is running for Congress and another race to replace Sen. Craig Estes, R-Wichita Falls, who was defeated in the Republican Primary. There will be two special elections, one to replace Sen. Carlos Uresti, D-San Antonio, who was found guilty of federal fraud and money laundering charges and another to replace Sen. Sylvia Garcia, D-Houston, who is running for Congress. None of these races is likely to make big changes to the partisan makeup of the Senate of 20 Republicans and 11 Democrats. The way Senate districts are drawn, the seats are rarely competitive between the two parties. However, on September 18, in what was considered a stunning upset, Republican Pete Flores defeated Democrat Pete Gallego in the special election for Senate District 19 – a district considered solidly Democrat. The special election changes the makeup of the Senate to 21 Republicans and 10 Democrats -- at least until November. One race Democrats will be eyeing in November is Senate District 10, which is based in Tarrant County and is represented by Sen. Konni Burton, R-Colleyville. Burton is getting a well-funded challenge from Democrat Beverly Powell, a former school board member and realtor. Other races that insiders think might be in play as long shots are the races for Senate District 16 between Sen. Don Huffines, R-Dallas, and Democratic challenger Nathan Johnson, as well as Senate District 17 between Sen. Joan Huffman, R-Houston, and challenger Rita Lucido. While there will likely be marginal change in the Senate, the Texas House of Representatives has more at stake. The House has 150 members each serving two-year terms. Therefore, all members are up this and every cycle. Just over a third of the House members – or 52 – are running with no opponent, while the remaining majority do not have serious opposition. The way most districts are drawn, the real battles take place in the primaries. However, there may be about 20 competitive races. Democrats are likely to pick up anywhere from zero to 12 seats. While that sounds like a lot of seats, it is not enough to make a significant difference to 95 Republican and 55 Democrat partisan makeup of the House. In addition, this election cycle we are losing some veteran members, not least of whom is Rep. Byron Cook, R-Corsicana, chairman of the House State Affairs Committee. Chairman Cook in 2017 played a critical role in supporting rural telecommunications and in supporting Senate Bill 586, which laid the groundwork to make sure rural telecommunications companies will have the financial support they need to maintain and upgrade their networks as we move forward in this constantly evolving industry. Possibly the most important and competitive race to watch going into the next legislative session does not even appear on the ballot – the race for Speaker of the House. The House speaker – the powerful presiding officer of the House – is not elected by the public but rather by the members of the lower chamber. The race was spurred by the retirement of Rep. Joe Straus, R-San Antonio, who has served six sessions as speaker. Unlike popular elections, most of the campaigning for speaker occurs between members and out of the public eye. There are currently seven declared candidates for speaker. Six are Republicans: Rep. Travis Clardy of Nacogdoches, Rep. Drew Darby of San Angelo, Rep. Phil King of Weatherford, Rep. Tan Parker of Flower Mound and Rep. Four Price of Amarillo. There is one Democrat running: Rep. Eric Johnson of Dallas. Given the partisan makeup of the House, the next speaker is almost certainly going to a Republican. There is also the possibility the next speaker will not come from this group but could be a yet-to-be-determined consensus candidate. All these House members are highly experienced and well-respected leaders, which will make for a very interesting race to name the next speaker when the session begins in January. From robocalls to broadband, telecommunications experts from across Texas and the nation explored some of the most pressing issues facing the industry during the Texas Telephone Association Convention and Product Showcase Sept. 9-12. Scott Stringer, TTA board chairman and director of regulatory and legislative affairs at CenturyLink, said rapid changes are facing the Texas telecommunications industry with the development of new technologies and new business models amid increasing competition. “There are a lot of issues impacting our industry,’’ Stringer said. Conference attendees received insight into regulatory activities at the state and federal level as well as action around the Texas Capitol while discussing some of the latest trends in telecommunications. Sen. Brian Birdwell , R-Granbury, delivered the keynote address the morning of Sept. 11, the 17 th anniversary of the Sept. 11, 2001, terror attacks on the World Trade Center and the Pentagon. Birdwell was in the Pentagon in Washington DC and reflected on his brush with death. “I’m doing pretty good for a guy who got run over by a 757 (airplane),’’’ Birdwell said. Bob Gnapp, director of member training and network analysis with the National Exchange Carrier Association Inc., provided an overview of robocalls and caller-ID spoofing and steps to combat them. U nwanted calls are one of the biggest consumer complaints in the United States. U.S. consumers received an estimated 2.4 billion robocalls per month in 2016, according to the Federal Communications Commission . Douglas Meredith, director of economics and policy with JSI , provided an overview of trends in broadband deployments in Texas and around the world, including consumer habits and business trends. TTA members heard from Public Utility Commission of Texas Commissioner Shelly Botkin. Botkin, who recently was appointed by Gov. Greg Abbott to the three-member commission, engaged in a question-and-answer session with conference attendees and shared some insights into her background. Texas local phone company executives provided perspective on ways they are serving their customers and competing in rural markets. Lyn Kamerman, TTA executive director, moderated a panel featuring Amy Linzey, CEO of West Texas Rural Telephone Cooperative, Inc. and WT Services; Robert Hunt, vice president of regulatory affairs at Guadalupe Valley Telephone Cooperative, and Toney Prather, president of Totelcom. “Things are changing,’’ Kamerman said. The rural telecommunications executives provided perspective on business issues including fiber deployments and competition from new entrants in the rural broadband market. The Texas Telephone Association recognized telecommunications leaders for contributions to the industry during the Texas Telephone Association Convention and Product Showcase Sept. 9-12. 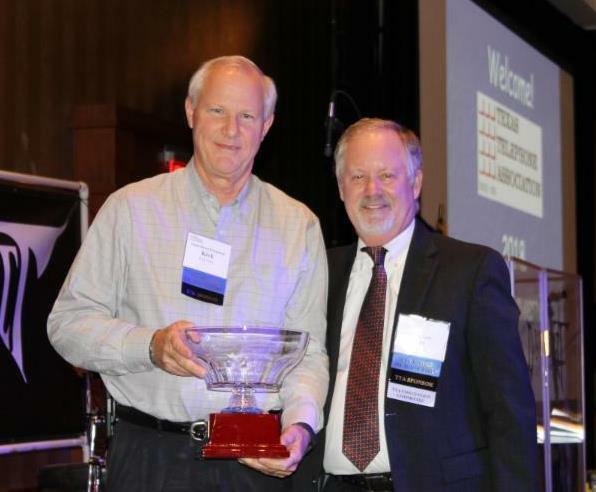 TTA recognized Kirk Petty, CEO and general manager of Santa Rosa Communications, with the Neville Haynes Award. 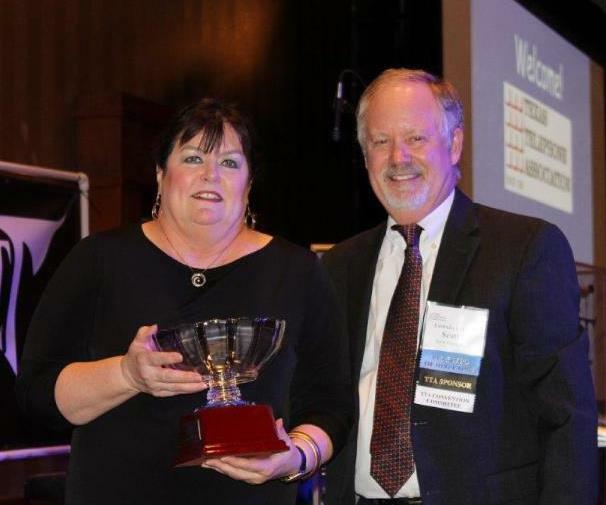 This award, the highest honor given by TTA, recognizes exceptional leadership and service and contributions to the Texas Telephone Association and the industry. Amy Linzey, CEO of West Texas Rural Telephone Cooperative, Inc. and WT Services , received TTA’s Outstanding Achievement award, which recognizes exceptional and highly effective service by an individual in a given year or for a single outstanding accomplishment of direct benefit to the industry and the association. 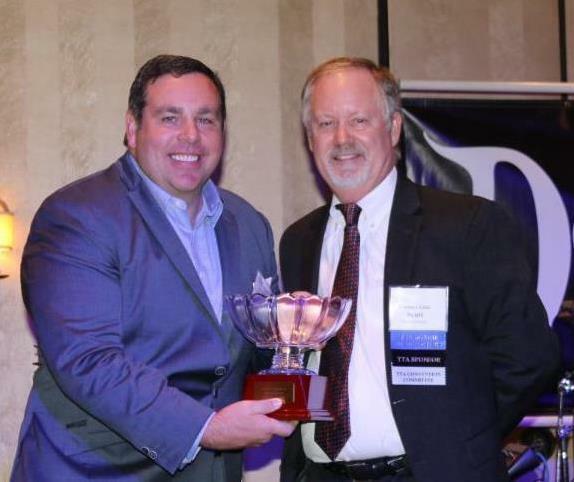 ﻿TTA recognized Dennis W. Donley, Jr., a partner at Naman , Howell, Smith and Lee, PLLC , as the Associate Member of the Year. This award recognizes exceptional service and contributions by an individual associate member in a given year or for a single outstanding accomplishment of direct benefit to the industry and association. Amy Linzey, CEO of West Texas Rural Telephone Cooperative, Inc. and WT Services, with Scott Stringer, chairman of the TTA board of directors. Kirk Petty, CEO and general manager of Santa Rosa Communications, with Scott Stringer, chairman of the TTA board of directors. Dennis W. Donley, Jr., a partner at Naman , Howell, Smith and Lee, PLLC, with Scott Stringer, chairman of the TTA board of directors. The Texas Telephone Association is meeting with new Texas PUC staffers on filings under the Public Utility Regulatory Act (PURA). 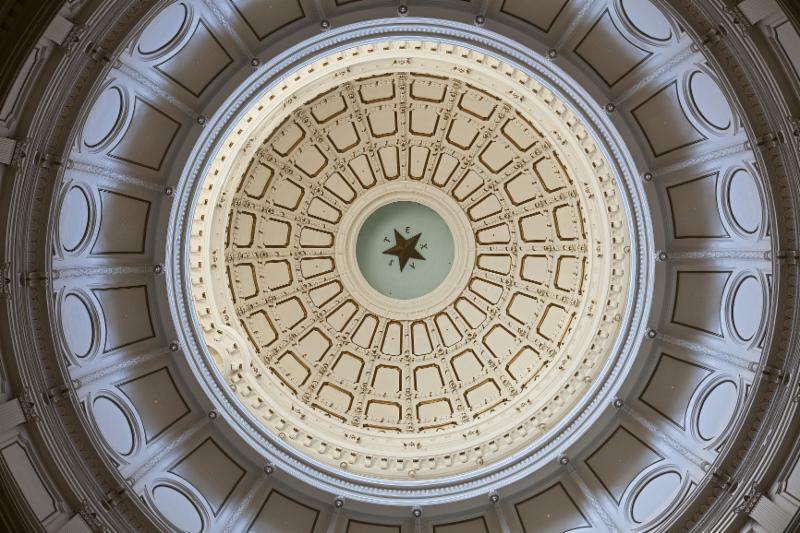 Texas Legislature has adopted provisions under PURA 56.025(c) that reimburse eligible small incumbent local exchange companies for losses related to the federal universal service fund because of regulatory reforms. This provision has commonly been referred to as “56.025 support” and many small companies have used the mechanism to replace losses in federal USF since 2012. The supporting documents that are commonly used in 56.025 filings must be updated to prepare for SB 586 Earning Monitoring Reports and other issues. TTA is drawing upon the expertise of its associate members who have prepared the supporting material for every Texas 56.025 filing to date — Moss Adams, JSI and GVNW Consulting, Inc. with significant help from Gary Smith with JSI and Tanner Namann of Eastex Telephone Cooperative — to collectively revise the current model for 56.025 support documentation. During the recent TTA annual meeting, TTA’s regulatory committee chairman, Wes Robinson, pulled together a 56.025 working group to discuss a proposed working draft prepared by Sharon Minor and her team from Moss Adams. TTA’s legal counsel has arranged for members of the 56.025 working group to meet with PUC staff in Austin on September 25 to perform strategic outreach both regarding a few immediate filings as well as to discuss the proposed revised model going forward. This meeting can also help familiarize newer PUC staff members with the supporting documentation and the history behind the model. With seemingly ever-increasing federal reductions, 56.025 support is an important cost-recovery option for many local phone companies in Texas and TTA is committed to making the process work for the benefit of its membership. ﻿We look forward to the opportunity to work collaboratively and strategically with PUC staff before the next member 56.025 filings are due. The Texas PUC staff on September 18 filed letters certifying certain companies are eligible to receive federal universal service support. The PUC recommended the commission issue an order authorizing certain companies as eligible to receive state universal service support. TTA encourages its member companies to review the lists of carriers the PUC certified as qualifying Eligible Telecommunications Carriers and qualifying Eligible Telecommunications Providers to make sure that they are included on both lists. If there are any errors, TTA is prepared to assist members needing to work with the PUC staff to resolve any discrepancies. Telecommunications companies will be required to offer customers 24-hour hour battery backup power in the event of a commercial power loss to provide uninterrupted access to 911 beginning in February 2019. The Federal Communications Commission (FCC) adopted backup power requirements for facilities-based carriers which provide fixed residential voice service in 2015. It has taken effect in stages since adoption and by February 2019, all providers must offer subscribers 24 hours of standby backup power. By February 2019, all TTA members should be prepared to make available a 24-hour battery backup source to all new customers and existing customers who express interest. If a single battery with 24-hour backup capabilities is not available for purchase by the compliance deadline, companies may offer the customer three eight-hour battery units to satisfy the requirement. TTA suggests member local phone companies review existing battery backup customer notifications to make sure they are current. WTA on September 13 filed an ex parte letter with the Federal Communications Commission indicating it will appeal the FCC’s recent order addressing broadband performance testing. WTA acknowledged the FCC’s need to make sure high-cost support recipients are providing reliable broadband services that meet certain basic performance requirements, but stressed that much of the contemplated broadband performance testing equipment is not yet available and may not be readily available at affordable costs for small carriers for several years. WTA said even when equipment becomes available, much of the testing framework appears designed for larger carriers. In addition, WTA noted the challenges associated with getting rural customers to agree to allow testing of their broadband usage for the federal government. Public and private stakeholders from across Bastrop County gathered at the Bastrop Public Library in a discussion about high-speed internet access for rural residents. The discussion was hosted by nonpartisan policy organization Glasshouse Policy and lead by Texas Senator Kirk Watson and Texas Representative John Cyrier. County Judge Paul Pape and Precinct 2 commissioner Clara Beckett, representatives from the Bastrop Independent School District, members of the public and more weighed in on the issue. The purpose of the discussion was to gather feedback and look for solutions to providing broadband internet access to people who live in areas where there might not be many options. Read more. HUDSON OAKS -- A Parker County company will bring high-tech jobs and high-speed wireless internet to rural areas in six states. Nextlink, based in Hudson Oaks, announced this week that the company received $281 million from the Federal Communications Commission to bring high-speed wireless internet to rural areas in Texas, Oklahoma, Kansas, Nebraska, Iowa and Illinois. The $281 million is the largest award under the FCC’s $1.98 billion Connect America Fund , which was established to close the digital divide in rural America. “The United States is moving to a digital economy,” said Bill Baker, co-founder and CEO of Nextlink. Read more. The Federal Communications Commission recently announced that nearly 36,000 rural Texas homes and businesses will receive access to high-speed internet within the next six years. The FCC’s Connect America Fund Phase II auction will give four broadband providers $82.4 million to expand broadband in rural areas of Texas where, absent this funding, this type of broadband expansion and ongoing service would not be economically feasible, a FCC press release stated. AMG Technology Investment Group won the bid for the eligible areas of Ector, Andrews and Midland County. The company will receive over $400,000 to service 118 locations in Ector County, which are focused most heavily in the 1st precinct. Read more. A new poll suggests 72 percent of voters, regardless of party affiliation, believe Congress and federal regulators “need to do more” to bring high-speed internet to rural Americans. The survey, done by the organization Connect Americans Now , which advocates for using TV frequencies for wireless internet, comes just a few weeks before the midterm elections. While broadband has been on the government’s to-do list since the George W. Bush presidency, more than 23 million rural Americans still lack access to sufficient speeds., according to the Federal Communications Commission . Read more. The proposed Universal Service contribution factor will exceed 20%. It will be 20.1% for the fourth quarter of 2018, according to a new FCC public notice. An FCC spokesperson confirmed that it is the highest ever. And it means that just over one-fifth of every dollar that users spend on interstate and international telecom services (essentially long-distance voice services) will go toward the Universal Service Fund (USF) program. Read more. Healthcare groups are coming out in support of the Federal Communications Commission’s $100 million Connected Care Pilot Program , saying the proposed telehealth project could improve access to care for rural and remote Americans by highlighting innovate remote patient monitoring and digital health platforms. Among those submitting comments ahead of this week’s deadline was the American Hospital Association, which urged federal officials to focus on using telemedicine and telehealth to improve care coordination and management. “Telehealth solutions have been shown to significantly improve health outcomes and lower overall healthcare system costs,” the organization wrote in a letter . “In particular, telehealth connects patients to vital healthcare services through video conferencing, remote monitoring, electronic consults and wireless communications.” Read more . Cable and telco ISPs have gotten together to lobby for the broadband buildout funding provisions in the Senate version of the "Farm Bill." The Senate and House have each passed versions, now being reconciled in conference. That came in a letter to Farm Bill conferees from the heads of NCTA-The Internet & Television Association, ITTA-The Voice of America's Broadband Providers, USTelecom and NTCA-The Rural Broadband Association. They are particularly supportive of the Senate version's better targeting of broadband funding to prevent overbuilding, including where there is already federal funding via the Universal Service Fund broadband subsidies. The Senate version requires that areas eligible for Rural Utilities Service broadband buildout funds be at least 90% unserved by high speed broadband, defined as at least 25 Mbps downstream/3 Mbps upstream. Read more. Suffering heat stroke on an un-air-conditioned Tulsa, Oklahoma, transit bus, Sweet Paula Ogans-Recess' cell phone may very well have saved her life. Losing consciousness as her complexion flushed, she dialed 911. First responders traced her call, found her, and administered aid. "I would have died... If it wasn't for the phone, I wouldn't be here," said Ogans-Recess. It's why she never leaves home without her phone—a phone Ogans-Recess has because she participates in the Lifeline program, a Reagan-era subsidy initiative. But now, her participation in the program might be at risk, as she is one of more than 7 million low-income households threatened to be disconnected from their phone service under a government proposal to curtail the federal subsidy program. Read more. The U.S. Department of Agriculture awarded $43.7 million in funding for rural smart grid projects. The USDA smart grid funding was part of a broader announcement of a total of $398.5 million to improve rural electric service in 13 states. The funding came in the form of low-interest loans. The USDA smart grid funding could be good news for rural broadband providers, as smart grid projects rely on advanced communications infrastructure and rather than build that infrastructure themselves, some electric companies partner with broadband providers for that purpose. In some cases, this can help build a business case for fiber deployment to support broadband services in areas where it previously was not economically feasible. At least one rural electric company in the latest group of funding recipients has partnered previously with a small rural broadband provider. Mille Lacs Energy Cooperative partnered with Consolidated Telephone Company on a previous buildout. Read more. State attorneys general (AGs), for better or worse, are increasingly important actors in tech policy. As political scientist Paul Nolette explains in “ Federalism on Trial: State Attorneys General and National Policymaking in Contemporary America ,” many AGs, no longer content to police garden variety consumer protection issues, now drive national policy through activism and “adversarial legalism.” The internet is a greenfield regulatory opportunity, and in the tech policy realm AGs are flexing their muscle on online privacy, net neutrality, and data security. Read more.